Could a foreign power such as Russia try to infiltrate the Voice of America (VOA) or influence its executives, broadcasters and programs? Could U.S. government-hired journalists and program contributors, acting on their own, support in VOA broadcasts accommodation with authoritarian rulers in countries such as China, Cuba, Iran or even North Korea? Could one-sided propaganda produced by federal employees, which fails to project an objective and balanced view of the United States or news developments abroad, be distributed domestically to unsuspecting Americans? It all happened with regard to Russia during World War II, mostly because President Franklin Delano Roosevelt appointed managers, and the agency in charge of Voice of America broadcasts hired journalists, who while with a few exceptions not actual Soviet agents, were highly sympathetic to the Soviet Union and supportive of communist ideology and propaganda. One of the earliest warnings of Soviet influence within the Office of War Information (O. W. I. ), where radio broadcasts for foreign audiences which only later became known as the Voice of America originated during the war, was a Republican U.S. 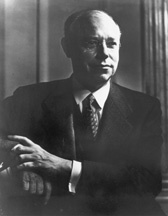 Senator from Ohio, Robert A. Taft. “It is said that some of it is communistic and some of it is fascistic, and that much of it tries to play European politics, about which we know nothing, instead of presenting the American point of view,” Senator Taft added. There was no evidence that any of VOA programming during the war was intentionally pro-Nazi—it was intended to be strongly anti-Nazi—although some of the simplistic anti-Nazi propaganda could have been seen as having an impact contrary to its intended aims. 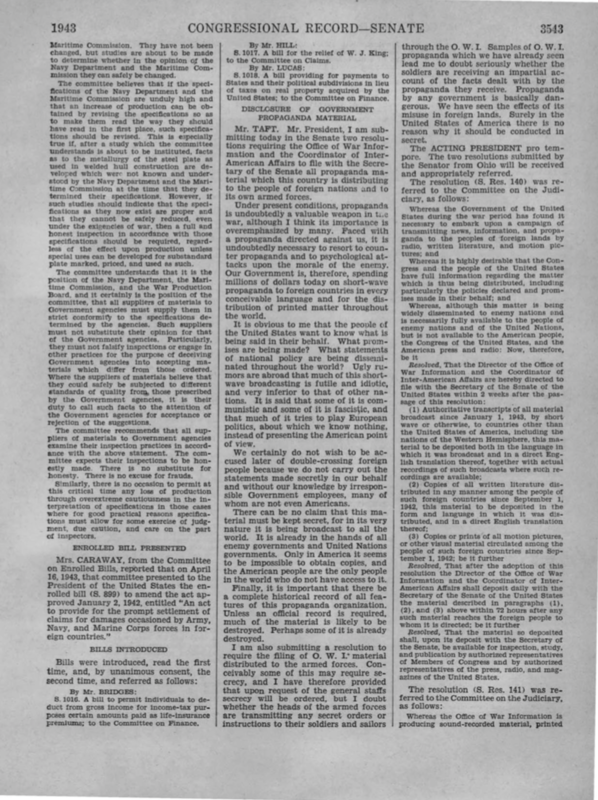 There was, however, clear evidence of massive VOA propaganda in favor of the Soviet Union and Stalin’s plans to control Eastern Europe to the point of harming American interests and damaging America’s other allies and their democratic governments against whom some of the Soviet-inspired VOA propaganda was directed. In a previously secret and now still little known collusion with Russia, U.S. officials controlling the agency in charge of VOA were coordinating American domestic and foreign propaganda with Soviet propaganda during World War II. While Russia was America’s military ally against Nazi Germany, much of the American propaganda was harmful to anti-Nazi and anti-communist supporters of democracy. Only after the war, as a result of earlier scandals, the passage of the 1948 Smith-Mundt Act ensured strict security background checks for Voice of America broadcasters. The postwar legislation also prevented VOA from having its programs distributed domestically to propagandize to Americans, as O. W. I. broadcasters were allowed to do during the war. Both Polish and Czechoslovak services of the Voice of America during the war had communists working as managers and journalists. Support for Stalin and his plans to install pro-Soviet governments in Eastern Europe continued unabated in Voice of America programs until at least 1945, if not much longer, although not with the same intensity as during the war. 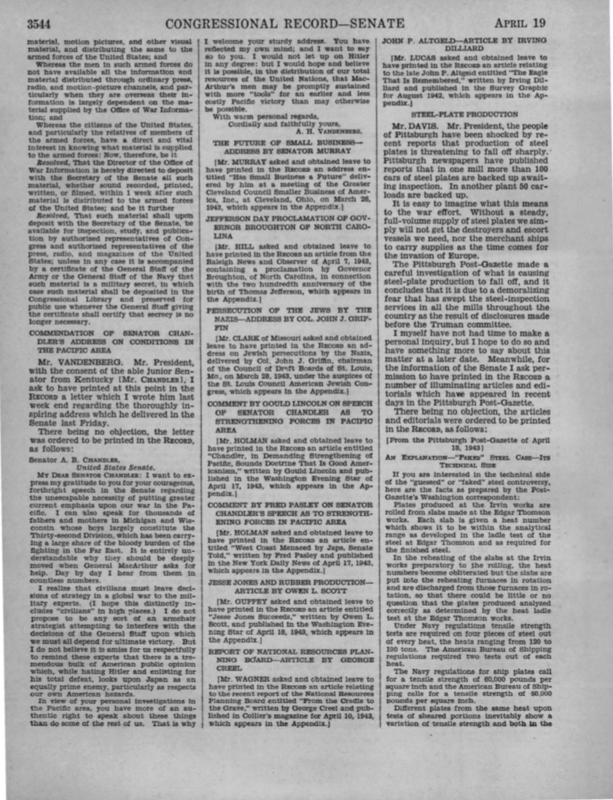 Some of the censorship of news reports about communist crimes continued at the Voice of America until the early 1950s. At least two World War II Voice of America journalists who earlier held key positions in the Polish Service (Stefan Arski, a.k.a Artur Salman) and the Czechoslovak Service (service chief Dr. Adolf Hoffmeister), went to work for communist regimes after the war. Arski became an influential anti-U.S. propagandist in communist-ruled Poland, while Hoffmeister was Czechoslovak Ambassador to France from 1948 to 1951. Hoffmeister later had a falling out with the communist regime while Arski remained a loyal communist. It should be noted that during World War II, the name “Voice of America” was not commonly used and these programs were not referred to as VOA or Voice of America; they were referred to as originated by the O. W. I. Broadcasts for overseas audiences were produced by O. W. I.’s Overseas Division in New York. Congressman Roy Woodruff (R-MI) in his speech to the House of Representatives on April 20, 1943 accused the O. W. I. of broadcasting communist propaganda. “I cannot understand why the Director of War Information is feeding Communist propaganda to the American people in regard to the conditions in Yugoslavia,” Congressman Woodruff told the House of Representatives. At that time, propaganda broadcasts, as they were often described by O.W.I. officials using this term, were also redistributed and rebroadcast in the United States. “…now reports are constantly reaching me and other Members of Congress that the propaganda activities of the Polish Unit of O. W. I.’s Overseas Division are destroying rather than building the morale of the helpless Polish people,” Rep. Woodruff told the House of Representatives. “If It is true that Communists have infiltrated into the O.W.I.’s Overseas Division and are following the party line in their propaganda to Poland, as well as other countries, then it is an outrageous violation of the faith that is reposed in Elmer Davis and Robert Sherwood,” Rep. Woodruff continued. “If this is not true, then the Polish people in America are entitled to have allayed the rumors which may be enemy inspired,” he added. As it turned out, his information was accurate. Alarmed by pro-Soviet and pro-FDR propaganda being pushed by U.S. government employees at taxpayers’ expense on Americans, including American soldiers fighting overseas, Senator Robert Taft introduced a resolution in 1943 demanding that all O. W. I. materials, including what would now be described as Voice of America broadcasts in English and foreign languages, be made available for inspection by congressional staff and media. “Propaganda by any government is basically dangerous,” Senator Taft told the U.S. Senate. “Surely in the United States of America there is no reason why it should be conducted in secret,” he added. But the Office of War Information and its broadcasts for overseas audiences also had a few defenders in the U.S. Congress. 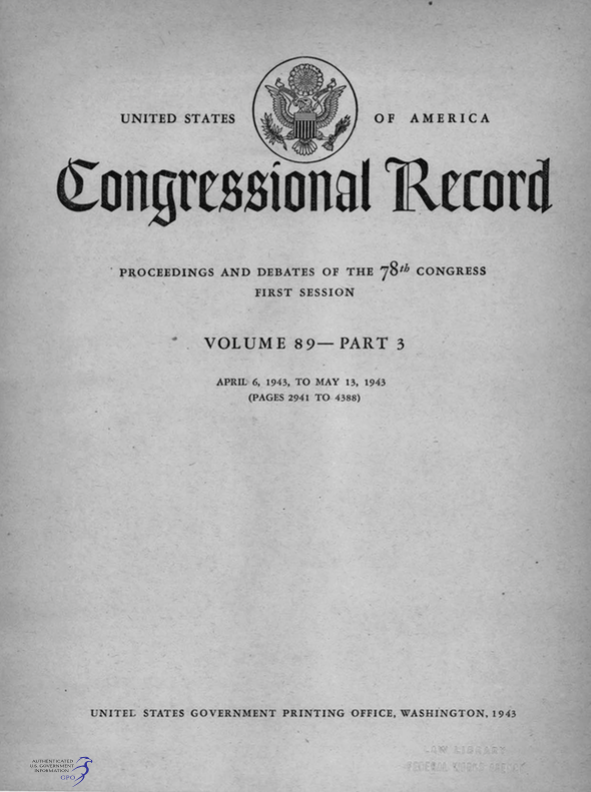 On June 29, 1943, Congressman Emanuel Celler (D-NY), who at other times praised Stalin and the Soviet Union as defenders of peace, progress and democracy, inserted in the Congressional Record several articles defending the Office of War Information from congressional attempts to cut its budget for domestic or foreign propaganda activities. 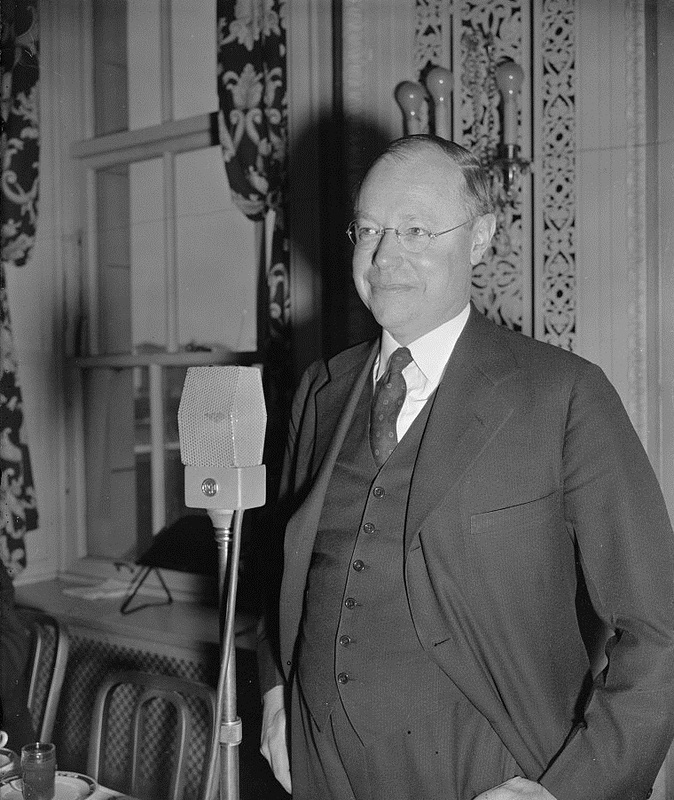 In his April 19, 1943 speech on the Senate floor and in introducing his resolution calling for making transcripts and translations of broadcasts available to Congress and media, Senator Robert Taft, who had a far more skeptical view of the precursor of the Voice of America than Congressman Celler, was not advocating that U.S. government-originated radio programs be rebroadcast in the United States. He was strongly against it. His objective was to get these taxpayer-funded and government-produced broadcasts translated into English and made easily accessible in order to be scrutinized by members of Congress, their staff and American media. The 1948 Smith-Mundt Act made this possible, although translating large amounts of recorded material was never a feasible proposition due to its complexity and high cost and were not attempted, but mandating random translations could have achieved the same purpose. Congressman Celler, like many other progressive Democrats at that time, was blinded by Soviet propaganda. He was, however, a strong critic of the Roosevelt administration for ignoring the Holocaust and not doing more to save European Jews from Nazi extermination. Houseman did not say that the promise to tell the truth did not apply to Soviet Russia, Stalin and a few other sensitive topics. While Voice of America’s WWII record of pro-Soviet propaganda broadcasting and its reluctance to challenge Soviet propaganda in the late 1940s and early 1950s was a shameful albeit still little known period in its history, VOA programming improved during the later years of the Cold War as a result of constant congressional criticism and contributed to the fall of communism in Eastern Europe, especially during the Ronald Reagan administration. Not all former VOA officials agree. Alan Heil wrote that Houseman’s theme of “honest reporting” “sustained VOA through the difficult winter of 1981/1982.” He was referring to the Reagan administration’s personnel changes and reforms which were enthusiastically embraced by many of VOA’s foreign language services, whose broadcasters hoped for more freedom in reporting on criticism of communist regimes, and strongly resisted by some of the longtime managers and some of the VOA Central Newsroom reporters who feared the return of anti-Soviet propaganda. In the end, Reagan reforms lead to significant increases in audience reach and influence behind the already crumbling Iron Curtain and most likely speeded up the fall of the Berlin Wall and the collapse of East European communist regimes. Mr. TAFT. Mr. President, I am submitting today in the Senate two resolutions requiring the Office of War Information and the Coordinator of Inter-American Affairs to file with the Secretary of the Senate all propaganda material which this country is distributing to the people of foreign nations and to its own armed forces. Under present conditions, propaganda is undoubtedly a valuable weapon in the war, although I think its importance is overemphasized by many. Paced with a propaganda directed against us, it is undoubtedly necessary to resort to counter-propaganda and to psychological attacks upon the morale of the enemy. Our Government is, therefore, spending millions of dollars today on short-wave propaganda to foreign countries in every conceivable language and for the distribution of printed matter throughout the world. It is obvious to me that the people of the United States want to know what is being said in their behalf. What promises are being made? What statements of national policy are being disseminated throughout the world? Ugly rumors are abroad that much of this short-wave broadcasting is futile and idiotic, and very inferior to that of other nations. It is said that some of it is communistic and some of it is fascistic, and that much of it tries to play European politics, about which we know nothing, instead of presenting the American point of view. We certainly do not wish to be accused later of double-crossing foreign people because we do not carry out the statements made secretly in our behalf and without our knowledge by irresponsible Government employees, many of whom are not even Americans. ￼There can be no claim that this material must be kept secret, for in its very nature it is being broadcast to all the world. It is already in the hands of all enemy governments and United Nations governments. Only in America it seems to be impossible to obtain copies, and the American people are the only people in the world who do not have access to it. Finally, it is important that there be a complete historical record of all features of this propaganda organization. Unless an official record is required, much of the material is likely to be destroyed. Perhaps some of It is already destroyed. I am also submitting a resolution to require the filing of O. W. I. material distributed to the armed forces. Conceivably some of this may require secrecy, and I have therefore provided that upon request of the general staffs secrecy will be ordered, but I doubt whether the heads of the armed forces are transmitting any secret orders or instructions to their soldiers and sailors ￼through the O. W. I. Samples of O. W. I. propaganda which we have already seen lead me to doubt seriously whether the soldiers are receiving an impartial account of the facts dealt with by the propaganda they receive. Propaganda by any government is basically dangerous. We have seen the effects of its misuse in foreign lands. Surely in the United States of America there is no reason why it should be conducted in secret. The ACTING PRESIDENT pro tempore. The two resolutions submitted by the Senator from Ohio will be received and appropriately referred. 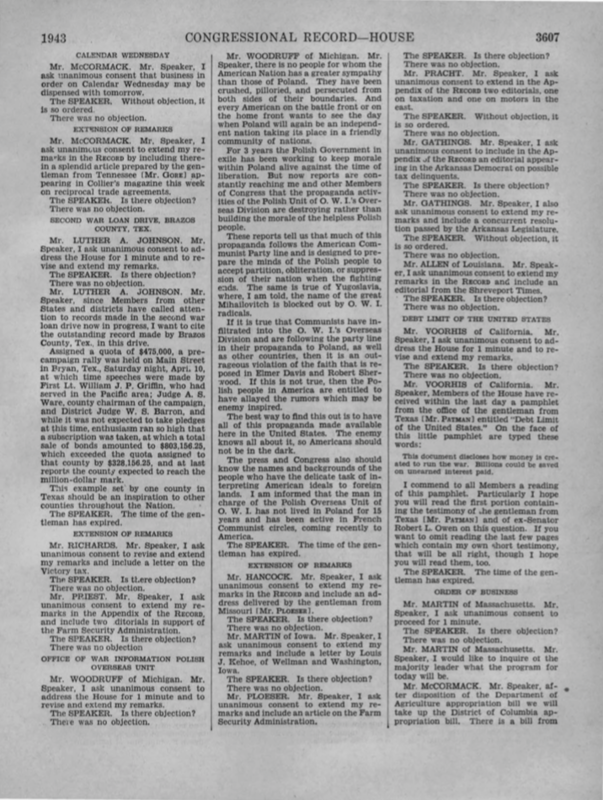 Resolved, That the material so deposited shall, upon its deposit with the Secretary of the Senate, be available for inspection, study, and publication by authorized representatives of Members of Congress and by authorized representatives of the press, radio, and magazines of the United States. Resolved, that such material shall upon deposit with the Secretary of the Senate, be available for inspection, study, and publication by authorized representatives of Congress and authorized representatives of the press, radio, and magazines of the United States; unless in any ease It is accompanied by a certificate of the General Staff of the Army or the General Staff of the Navy that such material is a military secret, in which case such material shall be deposited in the Congressional Library and preserved for public use whenever the General Staff giving the certificate shall certify that secrecy is no longer necessary. TAFT, Robert Alphonso, (son of President William H. Taft, nephew of Charles Phelps Taft, father of Robert Taft, Jr.), a Senator from Ohio; born in Cincinnati, Ohio, September 8, 1889; attended the public schools of Cincinnati, Ohio, and of Manila, Philippine Islands, and Taft School, Watertown, Conn.; graduated from Yale University in 1910 and from Harvard University Law School in 1913; admitted to the Ohio bar in 1913 and commenced practice in Cincinnati, Ohio; director in a number of business enterprises in Cincinnati; assistant counsel, United States Food Administration 1917-1918; counsel, American Relief Administration 1919; member, Ohio house of representatives 1921-1926, serving as speaker and majority leader 1926; member, Ohio Senate 1931-1932; elected as a Republican to the United States Senate in 1938; reelected in 1944 and again in 1950 and served from January 3, 1939, until his death; majority leader 1953; co-chairman, Joint Committee on the Economic Report (Eightieth Congress), chairman, Committee on Labor and Public Welfare (Eightieth Congress), Republican Policy Committee (Eightieth through Eighty-second Congresses); sponsored the Taft-Hartley Act, designed to create equity in collective bargaining between labor and management; unsuccessful candidate in 1940, 1948, and 1952 for the Republican presidential nomination; died in New York City, July 31, 1953; lay in state in the Rotunda of the U.S. Capitol, August 2-3, 1953; interment in Indian Hill Episcopal Church Cemetery, Cincinnati, Ohio. American National Biography; Dictionary of American Biography; Patterson, James T. Mr. Republican: A Biography of Robert A. Taft. Boston: Houghton Mifflin, 1972; Wunderlin, Clarence E. Robert A. Taft: Ideas, Tradition, and Party in U.S. Foreign Policy. New York: Rowman & Littlefield Publishers, 2005. 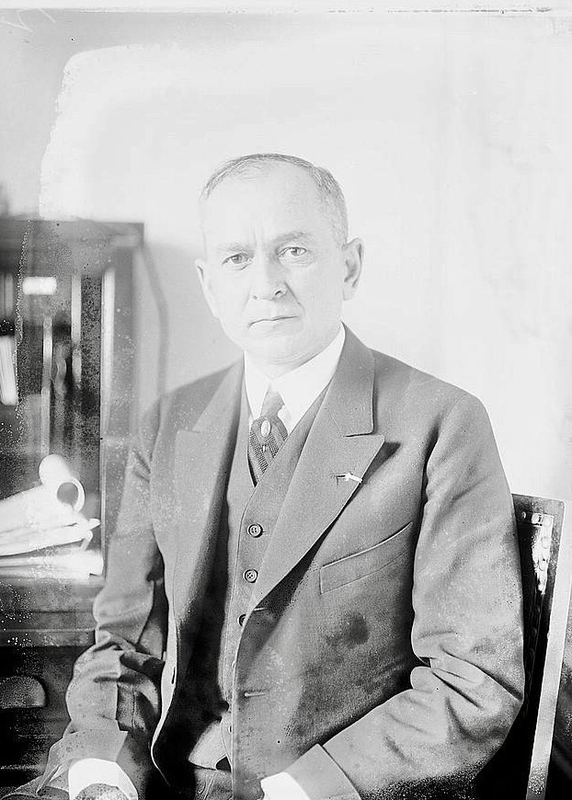 Former Congressman Roy O. Woodruff. Date: before 1953. Source: Library of Congress. Author: National Photo Company. ￼Mr. WOODRUFF of Michigan. Mr. Speaker, there Is no people for whom the American Nation has a greater sympathy than those of Poland. They have been crushed, pilloried, and persecuted from both sides of their boundaries. And every American on the battle front or on the home front wants to see the day when Poland will again be an independent nation taking its place in a friendly community of nations. For 3 years the Polish Government in exile has been working to keep morale within Poland alive against the time of liberation. But now reports are constantly reaching me and other Members of Congress that the propaganda activities of the Polish Unit of O. W. I.’s Overseas Division are destroying rather than building the morale of the helpless Polish people. These reports tell us that much of this propaganda follows the American Communist Party line and is designed to prepare the minds of the Polish people to accept partition, obliteration, or suppression of their nation when the fighting ends. The same is true of Yugoslavia, where. I am told, the name of the great Mlhailovitch [Draža Mihailović, a Yugoslav Serb general during World War II and royalist opposed to Josip Broz Tito‘s communist Partisans] is blocked out by O. W. I. radicals. If it is true that Communists have infiltrated into the O.W.I.’s Overseas Division and are following the party line in their propaganda to Poland, as well as other countries, then it is an outrageous violation of the faith that is reposed in Elmer Davis and Robert Sherwood. If this is not true, then the Polish people in America are entitled to have allayed the rumors which may be enemy inspired. The best way to find this out Is to have all of this propaganda made available here in the United States. The enemy knows all about it, so Americans should not be in the dark. The press and Congress also should know the names and backgrounds of the people who have the delicate task of interpreting American ideals to foreign lands. I am informed that the man in charge of the Polish Overseas Unit of O. W. I. has not lived in Poland for 15 years and has been active in French Communist circles, coming recently to America. WOODRUFF, Roy Orchard, a Representative from Michigan; born at Eaton Rapids, Eaton County, Mich., March 14, 1876; attended the common schools and the high school of Eaton Rapids; apprenticed to the printing business 1891-1899; enlisted as a corporal in Company G, Thirty-third Regiment, Michigan Volunteer Infantry, during the Spanish-American War; saw active service and was mustered out; was graduated from the dental department of the College of Medicine, Detroit, Mich., in 1902 and practiced dentistry in Bay City, Mich., 1902-1911; mayor of Bay City 1911-1913; elected as a Progressive to the Sixty-third Congress (March 4, 1913-March 3, 1915); was not a candidate for renomination in 1914; served for two years in the First World War as an Infantry officer, acquiring the rank of major during his service in France; elected as a Republican to the Sixty-seventh and to the fifteen succeeding Congresses (March 4, 1921-January 3, 1953); was not a candidate for renomination in 1952 to the Eighty-third Congress; died in Washington, D.C., February 12, 1953; interment in Elm Lawn Cemetery, Bay City, Mich.